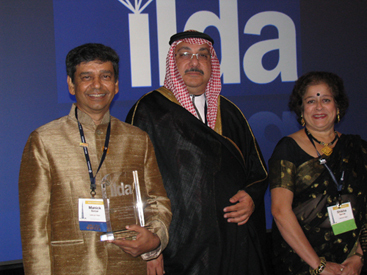 October 11, 2015, Dubai, UAE: Manick Sorcar received the coveted 2015 ILDA Artistic Award in Innovative Application of Laser category by winning the First Place in international competition for his entry "Light Art in Shower Ocean". The award trophy was handed by Tim Walsh, Laser Spectacles, USA at the Awards Banquet of the 27th Annual Conference of the International Laser Display Association, held at Radisson Blu Dubai Deira Creek Hotel, Dubai, UAE. of Laser from Tim Walsh of Laser Spectacles, USA. 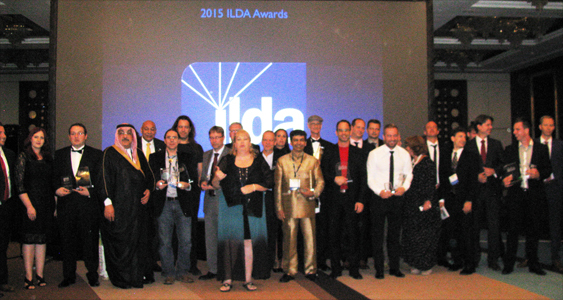 ILDA announced there was a total of 127 entries from 32 companies around the world for the prestigious awards. In the Innovative Category, the international panel of judges unanimously selected "Light Art in Shower Ocean" of LaserLight Magic company for the First Place. The second place went to Oracle Liquid, Australia for their entry 'G20 Summit Laser Interactive and Flag Projection Project'. There was no third place winner. LaserLight Magic is Manick's company for laser shows. 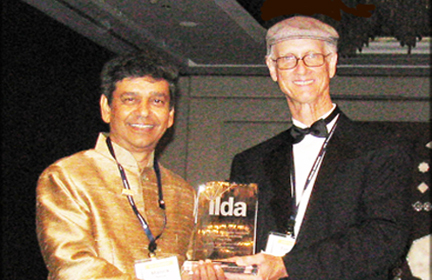 After receiving the award Manick said "I thank the international panel of judges and ILDA for honoring me with this award. It means a lot to me. 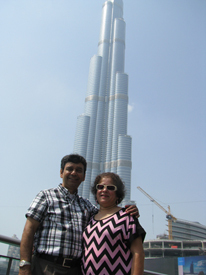 I also wish to thank Abdulwahab Bagdadi, 3rd Dimension EvenTech for hosting this conference in the beautiful city of Dubai". Regarding his entry he said,"All started when I was playing with a laser pointer creating artworks on a phosphor screen, which led to 'Light Art in Shower Ocean' showing what happens when the art comes alive, and the rest became history." 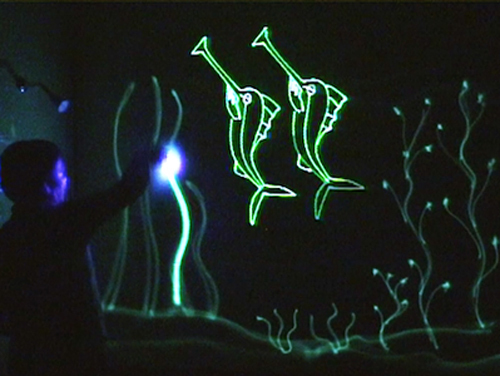 "What happens when a painted light-art comes alive? Here a man (artist) inside the shower stall during a sudden blackout, is stunned to see how his flashlight rays magically get 'stuck' to the wall tiles. He enjoys painting an underwater scene with moving creatures such as fish, long-nose fish, jellyfish, crabs, turtles etc. until a vicious shark attacks and all run for their lives....Entire concept, live-art, animation and music composition by Manick Sorcar".